President of SFA, Greg Mercurio, is featured in the Manufacturing Engineering November 2013 issue. 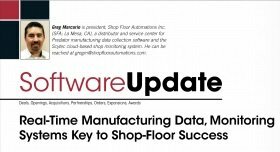 In the interview, he talks about real-time data and machine monitoring for the shop floor. Read the entire piece! Call 877-611-5825 – we invite you to be surprised just how affordable and easy these solutions are! Improve manufacturing by supplying accurate shop floor productivity metrics to improve operations & make better decisions. Enjoy automatic, error-free, & unattended machine monitoring for events such as job start/end, setup start/end, log on/off, cycle start/end, & more. Data collected includes cycle time, idle time, setup time, teardown time, machine downtime, & scrap reasons. Drive improvements based on real-time data. In today’s competitive manufacturing environment, it is more important than ever to be as efficient as possible. Increase machine up-time & drive innovation on your shop floor. What is the overall equipment effectiveness formula? Ask us!